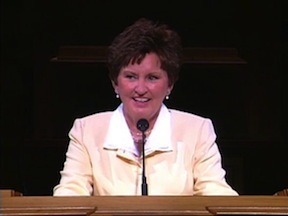 Sharon Greene Larsen is a former second counselor in the Young Women general presidency of The Church of Jesus Christ of Latter-day Saints. She served from 1997 to 2002. She also served on the Young Women general board and taught early-morning seminary and institute. She was a ward and stake Relief Society president. Larsen was born on February 6, 1939, in Glenwood, Alberta, Canada. She was raised working in the country store that her mother ran and in the fields with her father. Her older sister is Ardeth Greene Kapp, former Young Women general president. Larsen studied at the University of Alberta then transferred to Brigham Young University where she graduated with a degree in elementary education. She taught elementary school for several years in Utah and hosted a weekly educational television series called “This Is Utah.” She traveled around Utah, writing, producing, and acting in a weekly 20-minute program designed to teach social studies on a fourth-grade level. She then taught in Missouri while her husband completed dental school. She met her husband, Ralph, while at BYU. They are the parents of a daughter and a son. This page was last edited on 5 December 2015, at 21:18.